For some time, no one wanted word to get out. Rumors were circulating that the notorious and noxious Carmelo Garcia was backing Mike DeFusco for mayor and he was fundraising for the cause in parts south in the vicinity of Newark. listed as proudly backing Mike DeFusco for mayor. The flyer urges people not to hand in their Vote-by-Mail to "anyone you don't know." Vote-by-Mails are usually signed and mailed by the recipient. But with the list of known VBM recipients in the HHA and senior buildings public information, a war is brewing for who will "handle" the ballots. It reeks of a whole lot of poopy. This doesn't even begin to see opened the can of worms for voters across Hoboken. The flyer is strong evidence by it's discovery in the HHA strongly suggests Carmelo Garcia who is currently suing both the HHA and the City of Hoboken for seeing his contact terminated supports Mike DeFusco. 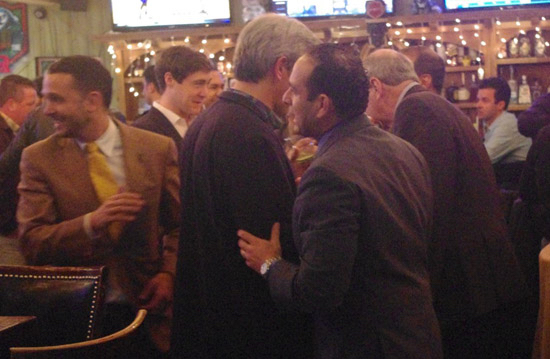 Carmelo Garcia (r) tries to work his way over to Mike DeFusco at his fundraiser last February. He's seen on a flyer backing Mike DeFusco for mayor. Talking Ed Note: The Romano campaign was not immediately available for comment about the flyer on their main rival and the Mike DeFusco campaign has not responded to inquiries to date. Sign of the Times: Setup!